Traceability shows the analyst how the business requirements have been satisfied by functional requirements and ultimately through the technical requirements. Consider the traceability matrix below. It shows the business processes on the rows, from a business perspective, and how they’ve been addressed with the functional requirements in the columns. With this matrix, you can ensure that each business requirement has been satisfied by a functional requirement. Although the traceability matrix is not the only way to ensure links to other requirements, it’s the most widely used. You want to be able to show that you have covered each requirement as you build upon it to the next level of requirements. It also lets you determine the impact of a change in the requirements, or helps you plan your release. You can also use traceability when evaluating what you can do with limited resources. Suppose each use case in the example costs $20,000 to implement. Implementing all five use cases, therefore, costs $100,000. But the project sponsor has only $60,000 to spend. Therefore, the sponsor can’t get all the business processes implemented with the amount of money available. Now you can start looking at the traceability to determine which business requirements you can address. You can implement UC1, UC2, and UC4 for $60,000. Doing so gets you 100 percent of business process 1.1 and 1.2, some functionality of 1.3, and nothing from 1.4. Or you can do UC2, UC3, and UC4, which gets you 100 percent functionality for business processes 1.2, 1.3, and 1.4, and some functionality for process 1.1 (covered in UC2). The matrix helps show how you can implement the release. Another advantage of traceability is for analyzing impact to your scope. 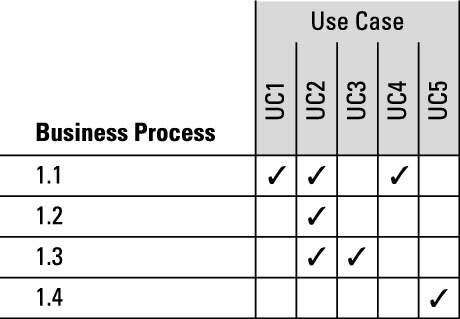 How quickly could you answer a stakeholder who asks, “What would happen if we changed process 1.1?” At this level, you can see that UC1, UC2, and UC4 are affected. By performing this impact analysis, you can analyze change requests very quickly within a project to determine the level of effort required to address a change request. Write the requirement in the matrix. Indicate the requirements that are linked to or traced to this requirement. If you’re using a requirements management tool, you may choose the traced requirements for those you’ve previously entered in the tool. Continue entering requirements and tracing them to other requirements, continuing on with test cases, program modules, and applications. The more you trace your requirements, the more accurate your impact analysis is. Generally, the objectives are traced to business requirements, then to functional and nonfunctional requirements, then to test cases and test results, and then to program modules. Business rules are traced throughout as the rules affect the requirements.